Community Broadband Toolkit | Strategic Networks Group, Inc.
SNG’s Community Broadband Toolkit is designed to help communities establish, or improve digital infrastructure and broadband services for the benefit of their residents, businesses, and municipality. The Toolkit builds upon SNG’s research studies and takes lesson learned from successful broadband projects conducted across North America. We offer this Toolkit as a comprehensive accompanying guide to the process of assessing economic feasibility and community readiness to communities and regions who know they need to address their digital infrastructure and smart community needs. 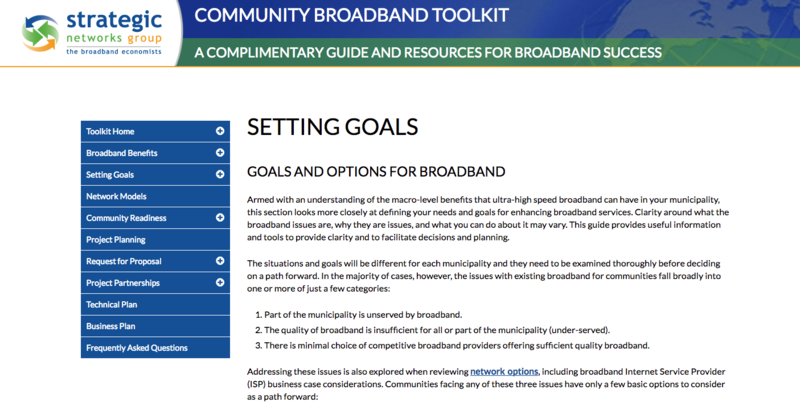 Consisting of a set of guides, templates and tools, the Community Broadband Toolkit 2.0 expands on SNG’s original toolkit developed in 2008. While many of the original elements have been retained and updated, there is now a strategic focus on how broadband investments can be an economic enabler for your community or region. Toolkit 2.0 also expands the range of potential solutions for addressing broadband needs, recognizing that municipalities – large and small – are faced with a variety of different circumstances. SNG’s Community Broadband Toolkit is structured to support a process from start to end, with guidance, research, and tools to assist along the way. Set Goals and Select Options Develop a clear set of goals for and outcomes you want and expect from broadband. Evaluate current issues and situation analysis and select an option most appropriate for the municipality. Consult with community stakeholders. Readiness Self-Assessment Perform a self-assessment to understand your municipality’s readiness to undertake a broadband implementation project. Any readiness gaps should be addressed with a clear action plan. The more ready you are the more successful your project will be. Broadband Project Management Plan Define (or refine) your broadband project plan. The plan should have a clear definition of roles and responsibilities, partners required, levels of effort and associated costs, and a timeline. Plans and actions must include promotion and community awareness and extend beyond the initial deployment phase. Commitment to Proceed Leadership must be committed and implementation capability must be in place. Sources of funding and other resources must be identified and committed. The decision-making body and process required for the project must be determined by each municipality. Request for Proposal (RFP) An RFP should be issued to suitable ISP vendors. Proposals should be evaluated with a clear methodology toward vendor selection. Prospective vendors should share their financial projections. Selected vendor should become a partner in the project. Partnership Agreement Partners in the broadband project should formalize their roles and responsibilities and contributions to the ongoing success of the broadband initiative. This provides clarity for all partners in working toward their shared goals (This does not preclude separate vendor contracts). Technical Plan In partnership with the selected vendor a broadband technical plan should be developed for the region to be served. The plan should consider both the initial deployment and longer-term evolution and operations. Business Plan Developed with the project partners, the business plan should provide the financial projections and plans for promoting broadband to maximize its use in the municipality and achieving positive economic impact. Implement Funding and resources are available and committed to proceed with broadband implementation. The decision to commence implementation should be made once the technical and business plans have been reviewed and accepted.